Ships The ships are all built to a scale of 1/600th. 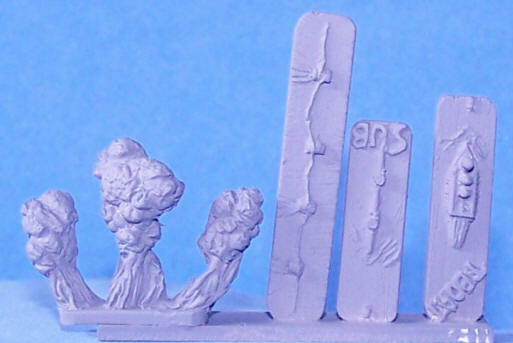 They are designed as robust wargames models. This means they should withstand some rough hands. The ships are all waterlined. The ships are quite thick in their waterline but you can sand them down as much as you want to make them sit lower in the water. 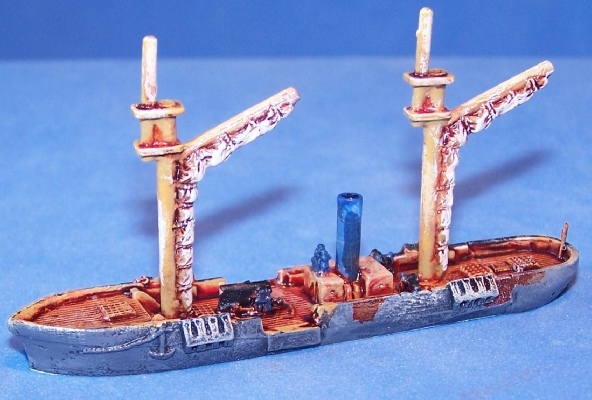 Masts Most ACW ships had any masts removed when in riverine actions. The masts were replaced by single pole masts for flag display etc. We DO NOT provide these pole masts in order to keep costs down, but do give indentations at the correct places on the models if a customer wishes to drill out the hole and put wire in. We can drill the holes and provide the wire for an extra cost (£2). Contact us by E mail and we will do the extra drilling and supply the wire or even glue it in of required. Funnels Each ship is provided with the appropriate funnel castings. 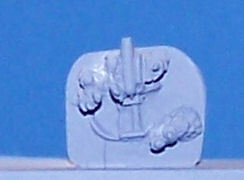 A lot of the ships use a universal funnel casting which needs to be trimmed to the right size. The funnel supplied is quite long in order to allow for customers who drill the original funnel hole deeper in order to create a super strong hole for the funnel. 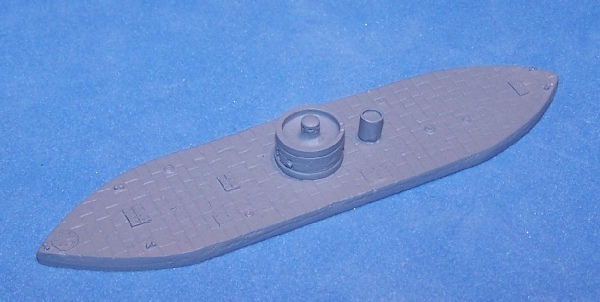 Any ship with a universal funnel will have a mm (millimetre) figure beside it, which indicates how tall the funnel should be above deck level. 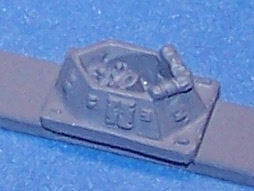 Ships boats Most ACW ships had lifeboats. 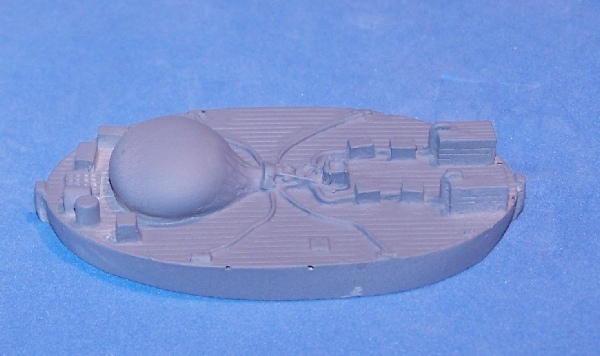 These were often towed behind in order to avoid cluttering the deck and gun arcs. 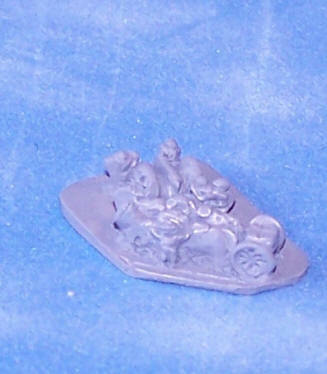 We DO NOT provide lifeboats with the models in order to keep the costs down. Lifeboats are sold as a separate pack (pack 13). These boats can either be surface mounted on the model, or two holes drilled and the boat davits dropped in to those holes. WE can do the drilling and fit boats for you at a cost of £3. Contact us if you require this service. The first version came out 20+ years ago. This 2011 edition uses many of the earlier mechanisms but now includes a scenario generator, more ship statistics as well as fire rafts, torpedo boats, mines, submarines and forts. Excellent. The rules include order cards and play sheets. No additional books needed. Gives a really nice game in 2.5 hours or less. Tim has put the wire spine on them to allow the book to be laid flat when gaming. The D6 +x tells players how many hexes in from their edge to place each ship. e.g given "Monitor, Governor Moore D6+1, D6-2" . Means that the Monitor is placed D6 add 1 spot hexes in from the table end and the Governor Moore is placed D6 +2 spots, hexes in from the table end. Hammerin' Iron game mat. 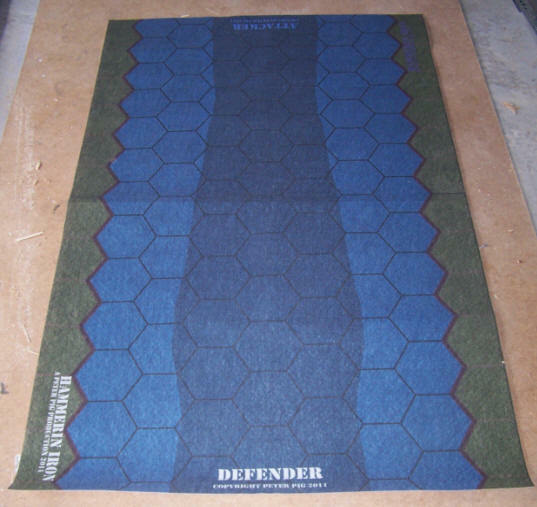 (07070) £29 This mat measure 5 feet by 3 feet. It is made of a lightweight polyester. It can get a bit creased if you are rough with it. However it can ironed by your husband using the least hot setting. These boats provide a good range of what was available to the Union navy. The Union had access to better shipyards and engineering. Many Union ships were pre-war wooden boats that soon came to grief against the new ironclad boats. Double turreted monitor. Too powerful. Very ugly Iron clad, big paddle boxes. Very big double ended steamship/sidewheeler looks powerful. 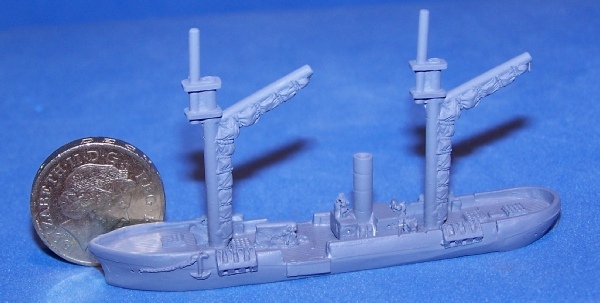 screw Sloop, Farragut's Flagship"damn torpedoes etc"
Size of a 90 day gunboat compared to a coin. 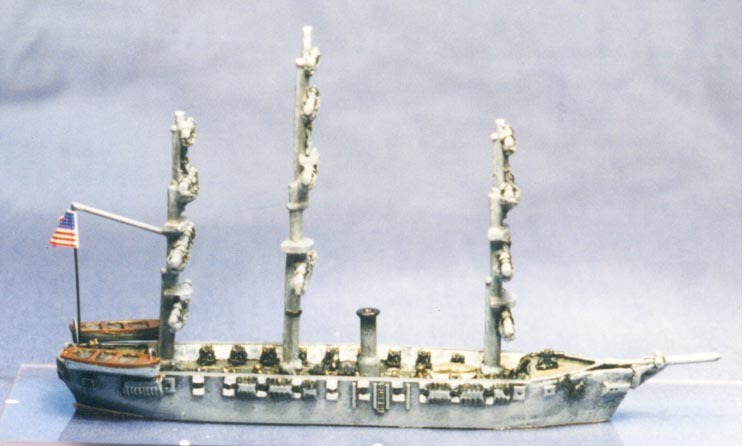 Many Confederate ironclads were built on hulls previously topped by wooden superstructures. Guns were varied and hard to come by. 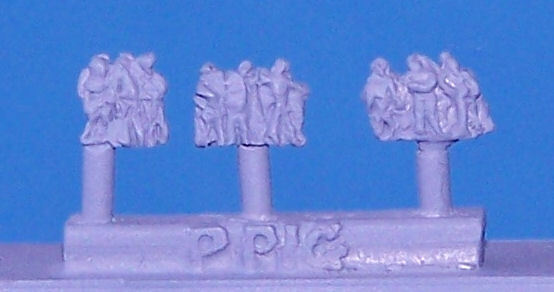 The number of gun ports does not indicate the number of guns as the guns were often missing or mounted on internal swivels to operate from several ports. 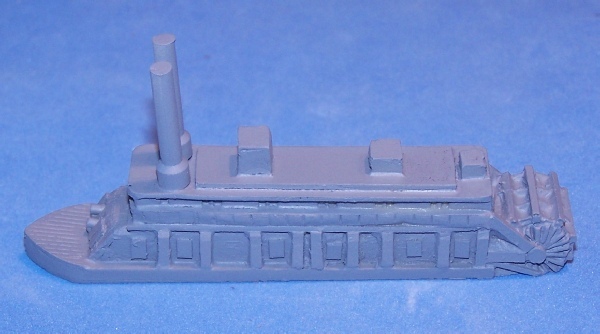 15.CSS General Sumter Side wheeled paddle ram , use for both sides. The best blockade runner of the war. These items can be used to enhance the look of the boats. You drill a hole in your boat deck and drop in a strip! 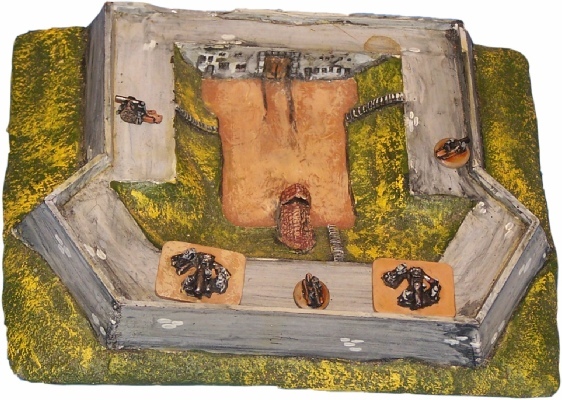 These troops can be used to run a land game alongside the naval game. They can also be used for battles in their own right. The guns are deployed with crews and limbers. The infantry are in ranks with flags. 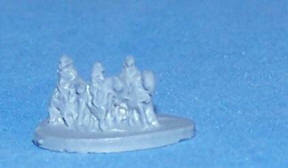 The cavalry are deployed in ranks. 10. 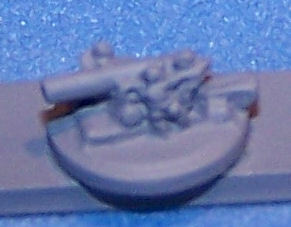 12pdr Guns and limbers (8 of). 62. HI "On table markers"
63. HI "Off table markers". 10 discs. These are discs with label/image to record ship damage. These markers are kept off table with the ship record sheet. These forts and pieces can be put along the river banks and shores. Either to shoot at the boats or to decorate the game. They are all to1/600th scale. 23. 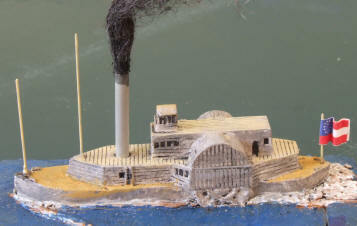 Wharf(5"). 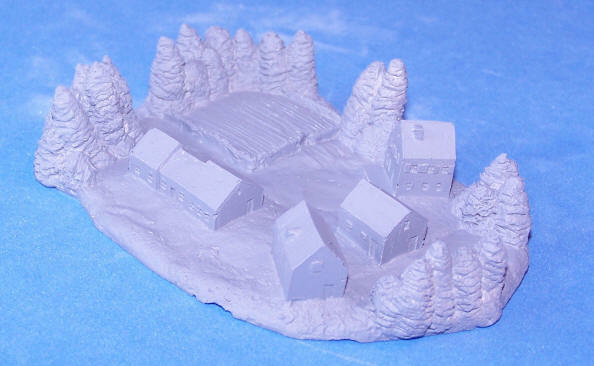 Has buildings and wagons cast on. A big model which includes all the necessary guns etc. 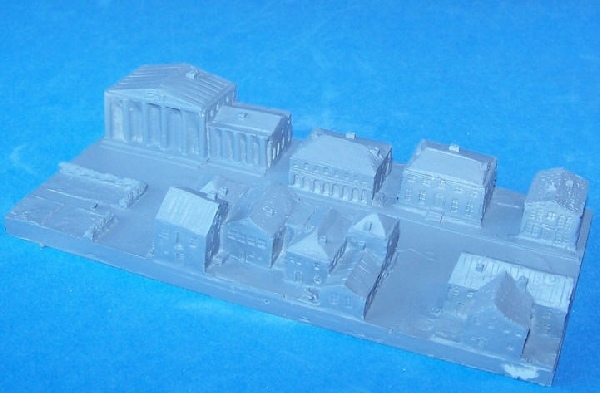 (2 buildings and 5 wagons)Suitable for objectives. 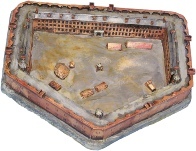 Click here for information about Naval boxed sets. 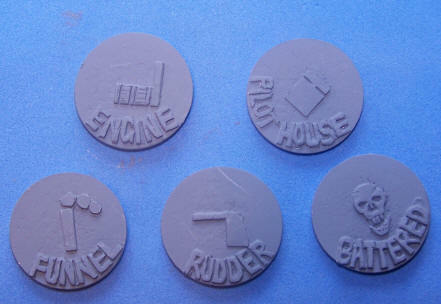 Ready made fleets for Hammerin’ Iron games.